This non - smoking cottage with 70 mq is for a maximum of 4 persons. You can also book directly with us without a credit card. Contact details can be seen below. 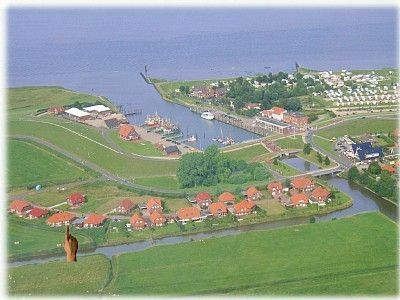 The few years old semi-detached house is located in a cottage / residential area right on the cutter harbor of Fedderwardersiel. The house is a Non smoking house and completely stepless walkable, it is friendly equipped with color TV and radio. Large living room with kitchenette and a cozy sitting area, as well as 2 bedrooms for a total of 4 persons, a bathroom and a guest toilet. A large terrace with garden furniture and a small lawn. Within walking distance you reach the Wattensteg and the new bathing area "Nordseelagune". From the cutter harbor you can take the MS Wega II to the seal banks, take a walk on a sandbank or a pirate ride with a treasure hunt. The MS Wega II is the only ship that can dry in the UNESCO World Heritage Wadden Sea - a unique experience for all guests. With a dyke length of 35 km, Butjadingen has the longest Wadden Sea coast on the North Sea. The North Sea Lagoon (2km) is a 1.6-hectare bathing lake, surrounded by a water and adventure playground, a sandy and green beach, volleyball fields and football field, as well as restaurants, beach and cocktail bar. The 200-meter-long pier leads from the adventure promenade directly to the Fedderwarder Priel, Watt walks, cycling, National Park House Museum Butjadingen. For the little ones, visit the play barn in Burhave. North Sea Tropics Park Tossens with a beautiful swimming area with a giant slide and wave pool. Seaside city of Bremerhaven, discover distant continents in the climate house, drive them with the harbor bus through the fishing port. The Zoo am Meer, the Maritime Museum and the German Emigration Center are worth a visit. Experience a day like in the south with Mediterranean flair, the shopping and adventure city in the middle of the new harbor worlds. Fedderwardersiel between Wilhelmshaven and Bremerhaven. The peninsula is surrounded by the Weser, Jade Bay and the North Sea. The nearest large towns are Burhave (2km) and Tossens (9km). In a few minutes you can reach the fishing port. The small harbor is home to a number of Krabbebkuttern, the Fishing out the shallow North Sea for crabs. The little animals, here called 'Garnet' Vedas still cooked at sea and arrive at high tide in the harbor at. The port has its own fish shop, is sold in the fresh North Sea fish. In Fedderwardersiel there are several restaurants and a supermarket are located right on the harbor.